"Sir Lamorak" redirects here. For the ferry named for the mythical character, see RFA Sir Lamorak (L3532). Sir Lamorak /læmərɪk/ (or Lamorac(k), Lamorat, and other spellings) is a Knight of the Round Table in Arthurian legend, a son of King Pellinore and brother of Percival, Tor, Aglovale, and sometimes the Grail maiden Dindrane and others. Introduced in the Prose Tristan, Lamorak reappears in later works including the Post-Vulgate Cycle and Sir Thomas Malory's Le Morte d'Arthur. Malory refers to him as Arthur's third best knight, only inferior to Lancelot and Tristan, but Lamorak was not exceptionally popular in the romance tradition, confined to the cyclical material, subordinate to more prominent characters. 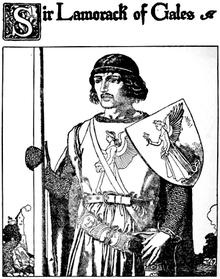 His father, King Pellinore, one of King Arthur's earliest allies, had killed King Lot of Orkney in battle; ten years later, Lot's sons Gawain and Gaheris retaliated by slaying Pellinore in a duel. Lamorak, who has grown up to join the Round Table, exacerbates the families' blood feud by having an affair with Lot's widow, Morgause, whose son Gaheris catches the lovers in flagrante delicto while staying at Gawain's estate and promptly beheads her, letting her unarmed lover go. Lamorak reappears at a tournament and explains the situation to Arthur, but rejects the king's promise of a truce. When he rides off, he is ambushed by Gawain, Gaheris, Agravain, and Mordred, who fight him all at once; ultimately it is Mordred who delivers the blow that kills him from behind. He was known for his strength and fiery temper, and fought off over thirty knights by himself on at least two occasions. His cousin, Sir Pinel le Savage, later attempts to avenge Lamorak's murder by poisoning Gawain at Guinevere's dinner party, but the poison is accidentally taken by another knight, whose kinsman blames the queen and tries to have her executed. ^ Sommer, H. Oskar (1891). Le Morte Darthur: Studies on the Sources. David Nutt. p. 197–199, 248, 282, 287 – via Google Books. ^ Schofield, William Henry (1895). Harvard Studies and Notes in Philology and Literature, Vol. IV. Ginn & Company. p. 184, 185,193 – via Google Books.